The Burden brothers and 430 West are inseparable from the evolution of Detroit electronic music. This spring, they reanimated the main project Octave One with the group’s fifth album “Burn It Down” and have reissued a couple of classic EPs, including Never On Sunday’s “Day-By-Day”. Never On Sunday (aka N.O.S. ), a short-lived side project of Lenny, Lawrence and Lynell Burden, may not ring a bell for many because of only two EPs in the beginning of the 1990s. 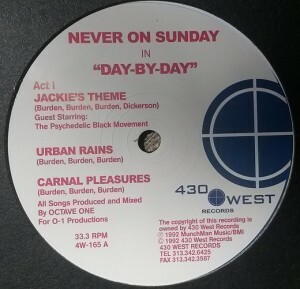 Apart from that, some individual tracks were released on compilations, like futuristic tech dreamer “Urban Rains” on 430 West’s excellent “Detroit Techno City”. This particular track is an exception in the EP which expresses house moods with jazzy touches. It is music for feeling good, when taking the smoothness of the sax and piano combo in “Jackie’s Theme”, Lisa ‘I Believe’ Newberry’s sweet voice carrying “In The Breeze” or sensual treatment given in deep house cut “Seduced By Madness. Reissues of real gems are a kind gesture, especially when a 300 copies run of the original hand-numbered, clear blue vinyl from 1992 has been trading for about 100 dollars.